The property is approached by a long track off a quiet lane. The main house faces east and comprises a large farmhouse kitchen (approx 22m2) with oak cabinets and an "insert" wood burner/oven. Off the kitchen is a lobby with built-in cupboards, a WC and shower room. Another door leads to the laundry room. The sunny sitting/dining room is approx 32m2 and has a large wood burner and French doors which open to the patio. Upstairs are three double bedrooms and a large family bathroom with twin sinks. There is a separate Villeroy and Bosch patterned WC. The master bedroom has a balcony along its length and a small dressing room. The other two bedrooms have built-in wardrobes. The house has oil-fired central heating. Please note there is some distant noise from the N124 Auch road. The attached gite comprises a kitchen, sitting dining/room with open fire and a door to the south-facing patio, a shower room and large bedroom on the ground floor while upstairs are the second bedroom and a bathroom with large sunken bath. The gite has electric heaters. 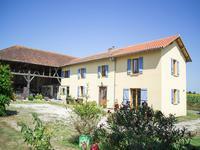 The main house and gite both need refreshing. Opposite the house is a large L-shaped barn, while nearby is a more recent double garage/workshops. Tucked away from the house is a 10m x 5m swimming pool surrounded by decking, with a shaded seating area. There is an orchard with a variety of trees and grape vines. The land is currently sown with lucerne and grass, though it has been planted with maize and sunflowers in recent years. There is an area of woodland with a walk through, and a spring with small pond. The land would suit horses or agriculture. The house is a 2-minute drive from the centre of the popular market town of Vic Fezensac, renowned for its Latin-American festival at the end of July. It has a wide range of shops, bar/restaurants and a cinema which sometimes shows English-language films. The property is only 1h15min from Toulouse airport.